Every once in a while a whale dies and washes up along the shorelines of a community and CHAOS ensues. Well, chaos, may not always ensue, but in this case there is a big problem. 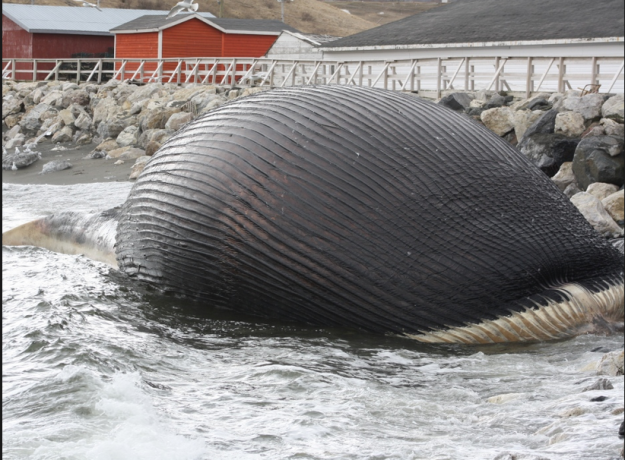 A giant blue whale washed up on the shores of a small fishing community in Newfoundland this week and residents of the community fear that it may explode. The giant blue whale is one of only nine of the endangered species. It’s believed to have died in heavy ice off of Canada’s Atlantic coast weeks ago. The whale is 81 feet long and could weigh up to 180 tons, but it has bloated up to twice it’s normal size laying on the shore. The whale washed up along the shores of the Trout River’s boardwalk and has attracted many people who have come to look at the giant mammal and check out the danger. “It’s sitting on our beach and filling up with (methane) gases, and there is a concern that it can explode,” town manager Emily Butler told AFP.com. Apparently the town of only 600 people does not have the resources to safely take care of the whale on their own and the Canadian government has refused to get involved saying that the whale should decompose naturally on the shoreline. They don’t want to drag it out into the water since it could become a hazard to navigation. While this is not the first time this has occurred and probably won’t be the last, whales exploding can cause a major problem. What do you think should be done with the whale? Let us know! Check out the video below from the 1970’s that shows what an Oregon town did to make a whale explode… and what it did back to them.